A city so rich in culture and always vibrant needs a website that’s just as rich and open for business. The old site was dark, uninviting, lack luster and did not have a mobile friendly web design. With over 30% of Internet traffic coming from mobile devices, that wasn’t acceptable. That’s why our South Jersey Web Design team gave The Convention Center Visitor’s Guide site a complete makeover. PhillyVisitor.com features a new mobile friendly web design that looks amazing due to its fully customized WordPress platform delivering rich photos and bold colors – all of which are completely mobile friendly. The city that’s bursting with life now has a website that easily promotes Philadelphia’s main attractions 24/7. A Mobile Friendly Web Design Means Great Looks and Ease in Use! The redesigned website looks more upscale and professional with the help of an impactful, beautiful slideshow full of pictures that showcase the city’s beautiful allure. Not only does it look good; it works great! The slideshow is fully compatible with iPads, iPhones, smartphones, and tablets. In fact, the whole Custom WordPress Website has a fully responsive design making it compatible on all mobile devices and tablets. 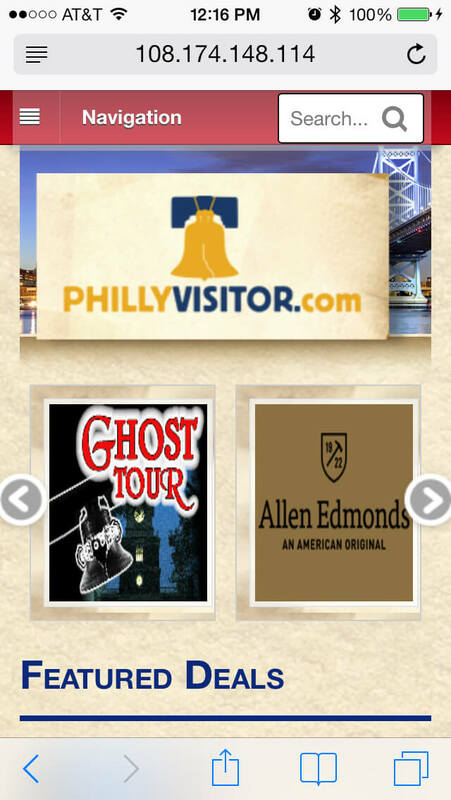 PhillyVisitor.com’s new mobile friendly web design allows visitors to use the site from all types of devices. 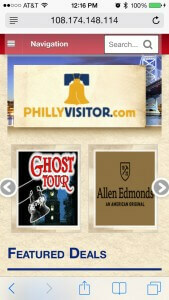 This is an exciting new feature for the redesigned PhillyVisitor website. Using the latest in responsive web design technology, their site will respond and change according to both the size and and resolution of the visitor’s device. Now, their visitors can view the website on varying devices, including iPhones, smartphones, tablets, or standard-size computers. This all allows easier access to the website and information. Since PhillyVisitor.com is built on WordPress, it is fully equipped with CMS (Content Magaenment System) giving the client the ability to update it at ease. The CMS platform allows the WordPress website to be completely client managed, eliminating the need for risky proprietary software. The client can also add new photos, videos, and updated content so the site can change with the city. A Custom WordPress Website for the People. Our South Jersey Web Design team designed The Convention Center Visitor’s Guide site with the public in mind. That is why there are so many interactive features in this Custom WordPress Website. An events calendar has been added to the site, complete with embedded Google Maps for locations. The calendar features all the hottest events in Philadelphia. Users also have the ability to download featured deals for restaurants and shopping. By design, PhillyVisitor.com is generally much more user friendly thanks to its WordPress and HTML5 platform.